V. Richard’s, the long-time (read: nearly 20 years) specialty grocery store located in Birmingham’s Forest Park neighborhood announced it was closing today via a post to its fan page on Facebook. 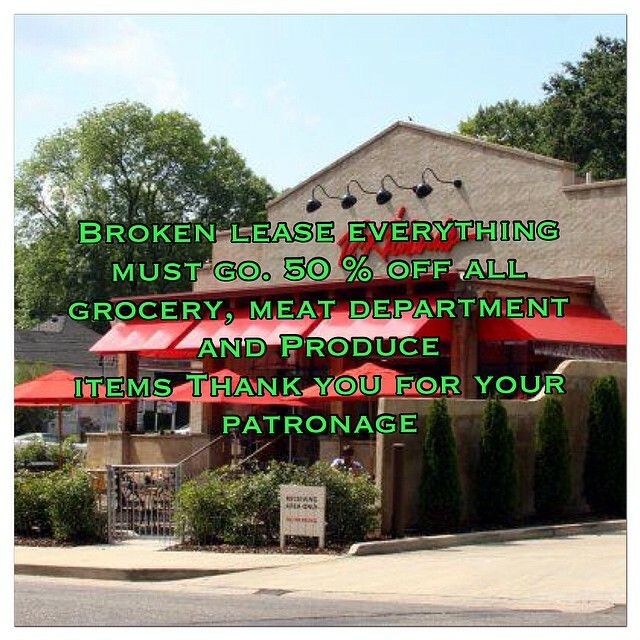 According to the photo included, the retailer’s lease was broken and everything must go, resulting in 50% discounts off of all meat, grocery, and produce items. There are no plans to reopen this business in another location (per the link included in our update). The news was shared a little less than four hours before the Microlove open house at Naked Art Gallery this evening. The closure means the closest grocery store for area residents is the Piggly Wiggly located at 3314 Clairmont Avenue. Its entry on Bhamwiki provides a fairly complete history of the retailer. The business had operated along Clairmont Avenue since 1995, beginning with a space at 3908. It moved into its current location, 3916 Clairmont Avenue — the building formerly occupied by Payless Drugs, in 2004. It allowed for more space, seating for dining, and a considerable increase in customer parking. V. Richard’s had explored expansion in the Birmingham market twice. It opened a second location in Homewood in 1999 but it closed within 18 months. The grocer had also been announced as an anchor tenant in 2010 for the long-awaited renovation of the Pizitz Building in Birmingham’s City Center, but as the project faced continuous delays it backed out. The grocery’s parent company still operates Catherine’s Market, located at Lake Martin as part of the Russell Crossroads development. Another property once associated with the company, Enzo’s Market in Chattanooga, TN, closed in June 2014 and was replaced with a concept store called Grocery Bar. The V. Richard’s name will live on, however — the Brookfield, WI location bought from the Littles in 2002 still uses it (albeit in a smaller space than it first occupied). UPDATE: Bryan Davis of the Birmingham Business Journal reports an inability of owner Ricky Little and the landlord to come to terms on a new lease agreement as the reason for the unexpected closing. Photo: Courtesy of the V. Richard’s fan page on Facebook. There are many nicknames that have been given to Birmingham, AL by its citizens. There are some that are actually associated with the city, including being the original Magic City – or are we? Another popular nickname is Steel City, though it doesn’t seem to be used by that many people outside of the city as it is inside metro Birmingham. A tag applied to the city since 1937 by some historical buffs is “The City of Perpetual Promise.” It’s taken from the title of a piece written by George Leighton for the August 1937 edition of Harper’s Magazine. The piece has influenced several pieces in recent years, from former Birmingham mayor Larry Langford’s 2009 Birmingham News editorial to a February 2008 piece published in Harper’s looking at what had changed since 1937. John Morse (the man behind BhamWiki) recently scanned the article and posted the pages to Flickr . The article is also available for reading via Harper’s Magazine‘s own archives in PDF format – if you have a subscription. You’ll also find the text included in a book published by Leighton in 1939. Birmingham native and former UAB starting quarterback Joe Webb ran 13 yards for the Minnesota Vikings to record his first career NFL touchdown during Monday night’s 40-17 loss to the Chicago Bears at TCF Bank Stadium in Minneapolis, MN. The Wenonah High School graduate was originally scheduled to start last night for the Vikings but future NFL Hall of Famer Brett Favre had other plans, starting for the 298th time in his career instead after his consecutive starts streak ended last week. A sack knocked Favre out of the game in the 2nd quarter with a head injury, leading to Webb taking over behind center. He finished the game completing 15 of his 26 pass attempts, good for 129 yards. He had one fumble, two interceptions and three sacks to go along with that touchdown. Saturday’s Birmingham News interview of Webb covered not just the understandable nervousness about this game, but also the unusual conditions associated with it. It’s an early holiday gift for fans of WorkPlay. We received word via an email earlier this afternoon from WorkPlay‘s Alan Hunter that the foreclosure sale of the entertainment venue scheduled for tomorrow (Wednesday) has been postponed by the bank due to to a pending deal. The announcement was also relayed via Alan’s Facebook profile shortly thereafter. More than 14,000 people joined the Save WorkPlay Facebook fan page after Dana Jaffe reported on The Second Front that the popular Southside venue was being threatened with foreclosure back on October 21, with pieces by The Birmingham News‘ Mary Carluso helping to raise the awareness level. The support has not gone unnoticed by those at WorkPlay. 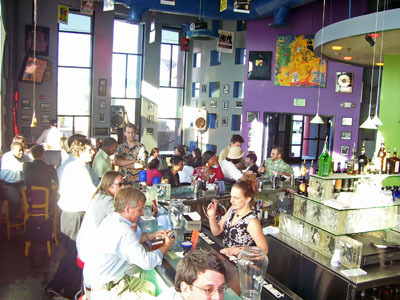 Photo: Overview of WorkPlay’s bar from 2006. André Natta/bhamterminal.com. Folks walking along 6th Avenue North between 19th and 17th Streets in downtown Birmingham may notice some large orange signs now located along the sidewalk. The four signs are the latest additions to the Birmingham Civil Rights Heritage Trail, first unveiled in August 2009. As first reported by The Birmingham News when the first signs were unveiled, the first portion of the trail will take people from Kelly Ingram Park to Linn Park. This sign is located at the corner of 19th Street and 6th Avenue North in front of First Church Birmingham. When Alana Edwards recently defeated two-term incumbent Odessa Ashley in the Birmingham City School Board District 7 runoff last week, she became the youngest person elected to serve on that board. The niece of Columbus, Mississippi’s first African American city councilman, Edwards’ hometown paper, The Commercial Dispatch, filed this brief in today’s newspaper – a user-submitted brief we might add.